Tense indicates the time of the occurrence of an action or an event. In any sentence, an action or a state of being is denoted by the verb. Hence, tenses are directly related to verbs. The different states of time are: Past, Present and Future. Very simply speaking, past is what happened yesterday; present is what happens today; and future is what will happen tomorrow. 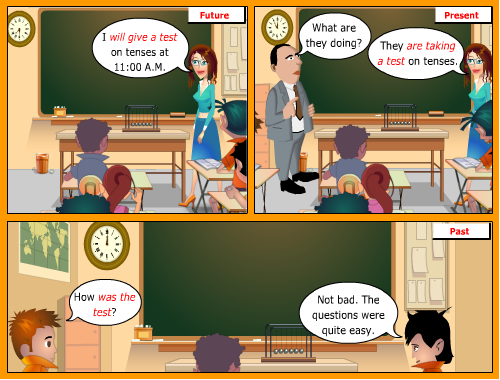 Note how at different moments the same event (the test on English tenses) can be situated in the future (when the teacher informs the students about the test), the present (when the test is being conducted) and the past (when the students are discussing the test). The simple present tense indicates an action or event that takes place regularly, without fail. The simple past tense indicates an action or event that took place at some moment in the past. The simple future tense indicates an action or event that will take place at some moment in the future. In the simple present and simple future tenses, the root form of a verb is used. What is the root form of a verb? The Root Form or Base Form is the simplest form of a verb.